Giant-pumpkin season is a sort of live-action agricultural romance novel tracking the lifespan of a passionate and ever-so-brief relationship. Seeds are planted, and the rest of the world slowly fades away as obsessive hobbyists begin ignoring all other responsibilities in the hope that they can grow a 1,000-pound vegetable. Heat lamps are placed around the plant, which by now probably has a name that its parent coos while watering it, to keep it warm. Enclosures are built to shield the pumpkins from frost. Gardeners start referring to their progeny from a different pollinator as “he” or “she.” Friends and family start wondering if this relationship is a healthy one. Months later, if the growers are lucky, all of that love and attention will help that seed grow into an ugly and obese gourd that they can then show off to all their friends before it rots and dies. And if it’s an especially big pumpkin, it might even win a contest and get saved for posterity in the pages of your local newspaper. 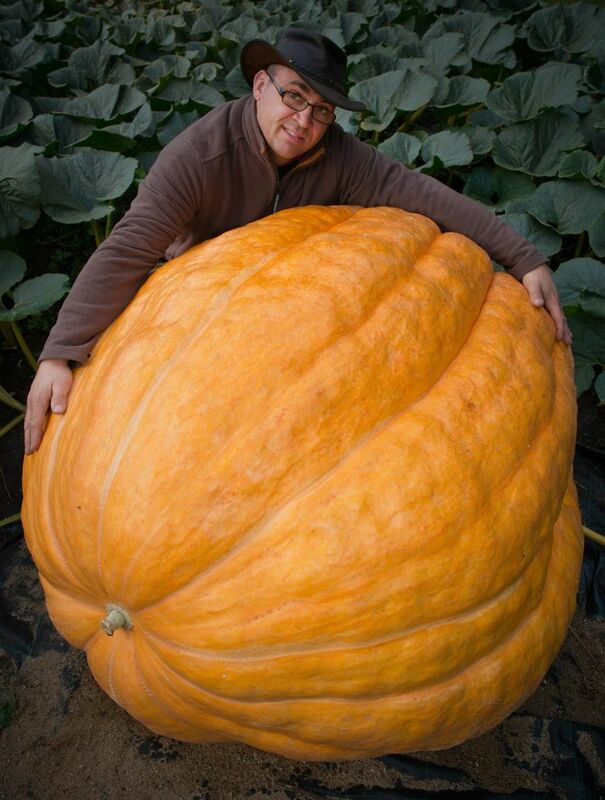 Many reporters have had the luxury of writing about colossal squash this fall. 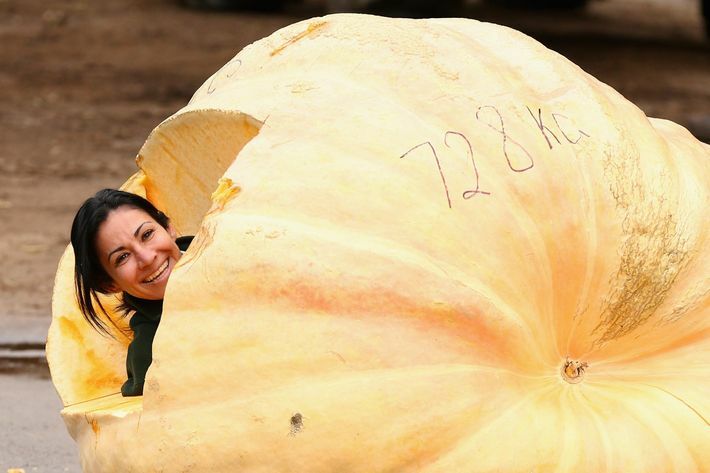 Below is a small taste of the best and most earnestly hilarious coverage of giant pumpkins and the people who are perhaps a bit fanatical about them. “Pumpkins bring out the smiles,” he said. Kuzel said it was almost like having another baby in the house considering how much time and effort went into caring for his giant pumpkins. “It’s like cutting the umbilical cord when you cut those big pumpkins off the vine.” he said. There have been setbacks, though, including a pumpkin that essentially exploded a couple of years ago. “I’m a doer, and my kids were always, ‘Aw, what are you doing now, Dad?’” the 69-year-old said with a smile. “I’ve always been a doer trying to create some fun.” Park, whose license plate says “BIGPMKN,” got into raising pumpkins in the late 1970s, and in the early ‘80s, he started looking into the science of raising giant pumpkins. Matching the celebrity to the shape of the pumpkin is the hardest part of the process, she said. The Jay Leno pumpkin needed a big chin. The Kim Jong Un pumpkin needed to fit the leader’s head shape. 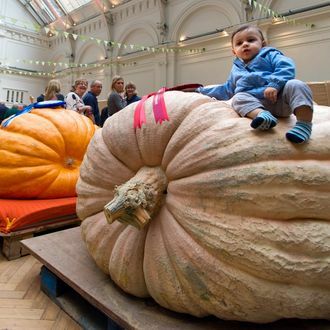 “This year, I had a contest on the internet to name this pumpkin, this 1,734, which is a sister to Tiny Schwarzenegger. And the contest winner, he came up with the name ‘TinyGotBack-inator,’” Clementz said. “Kind of a good ending to the season when you can have a lot of people come out and enjoy watching a pumpkin smash a van I guess,” he chuckled. “I knew that we had something special and it was just a huge mountain of pumpkin flesh,” said David Frerich of Frerichs Farm. It takes a lot more than syrup and cow poop to grow big pumpkins, squash and gourds, however.